Just when you think that you’ve seen everything under the sun, Seiko releases a new watch. Perhaps the Seiko brand does not command the same dominating presence it once had on the watch market, but their Seiko Astron GPS Solar could return the company to its dominating position in the horological balance. While the GPS function of the watch (the ability of the watch to correct its time and date by using GPS) isn’t new to the world of watch technology—Citizen released its own GPS watch last year—Seiko has taken a different approach to the watch. By combining solar power functions along to the GPS function, the Seiko brand has brought forward a watch that is more durable for everyday use. The GPS corrects the date of the watch all on its own by linking up with a satellite once a day (don’t worry: the solar power means the battery won’t fizzle out from these daily checks), so that you don’t have to. Supposedly, you can even use satellites to track the location of the watch….which means that you won’t have to adjust your watch, even in a new time zone. Now that is pretty cool. The watch is a nice mix between an open design and listing all the proper indices. 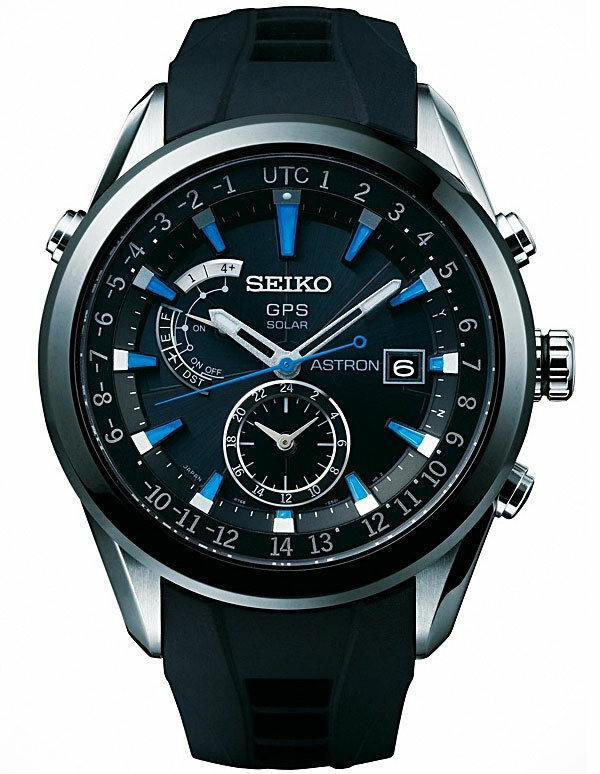 It can be a tough balance with a watch as packed full of functions as the Astron, but I think that Seiko has found a great balance between data and design in the face of the watch. The simple dial is a nice background to the time zones, seconds, and date functions on the watch. Available in black, with gold, blue, white or silver accents, the watch can fit into all wardrobes. Choose between a rubber strap or stainless steel bracelet. All the looks are clean and precise, though the blue and black rubber version has a sportier feel to it. The watch runs on solar power and a quartz movement, blending both of the factors together to craft a new piece. Quartz watches have not been in vogue for a while, but this latest from Seiko might bring them rushing back into stores and onto our wrists. Tech savvy and just plain cool, the Seiko Astron GPS Solar takes the best part of quartz watches and moves it a step farther. The watch looks great, is practical for the time freak and world traveler, and is just an amazing piece of new watch technology. 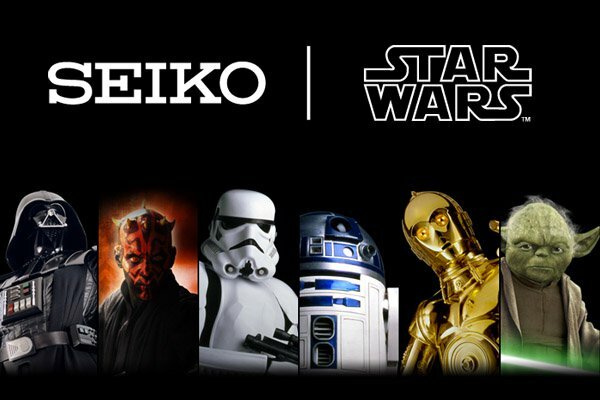 Japanese watch company Seiko is slated to release six limited edition watches to commemorate the 35th anniversary of the Star Wars films and the re-release of the films in 3D. Although it is unknown at this point whether the timepieces will be released internationally or only in Japan, October 12, 2012 is said to be the official release date. Each of the six limited edition models was made in honor of a Star Wars character: Darth Vader, R2-D2, Darth Maul, Yoda, Stormtrooper and C-3PO. 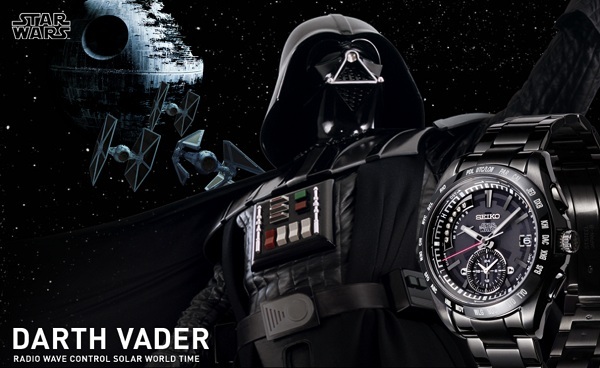 When you look at the case of the watch it’s not blaringly obvious that the watch has much to do with Star Wars aside from the film’s logo displayed modestly on the dial. At first glance, the watch looks very much like your typical Seiko watch with no special details or features. However, take a look at the case back of the watch and you will find the face of the Star Wars character that it was modeled after and the number of the watch. Each timepiece has a different number of available pieces and features. The C-3PO is available in 600 pieces at $1,750. It features a 6R21 automatic mechanical movement with a sleek black and gold colored dial. The Yoda is also limited to 600 pieces, retails for the same price and has the same movement as the C-3PO but with a more decorative green dial and a “light saber” seconds hand. The Darth Maul comes in a black IP coated steel case and has a 8B82 Caliber quartz movement with radio correction and features a stopwatch function. Darth Mauls are limited to 800 pieces and priced at $1,750. The Darth Vader model is very similar in features to the Darth Maul minus the stopwatch. It comes in all black, retails for $1,820 and is limited to 1,500 pieces. 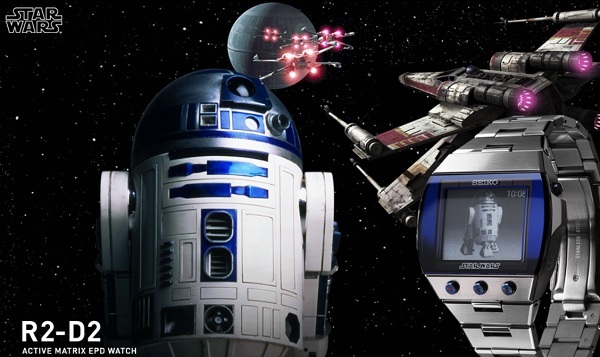 The R2-D2 is the only model that comes in a square case giving it a distinct look. It has a Solar Digital quartz movement Caliber S770 with an active matrix EPD with radio correction. It comes limited to 1,000 pieces and retails for $1,620.The Stormtrooper comes with a Caliber 6R21 automatic mechanical, is limited to 500 pieces and retails for $1,750. Seiko is also rumored to release a special set of all six models with some fun fan items included in the set. Star Wars fans have much to look forward to this year! 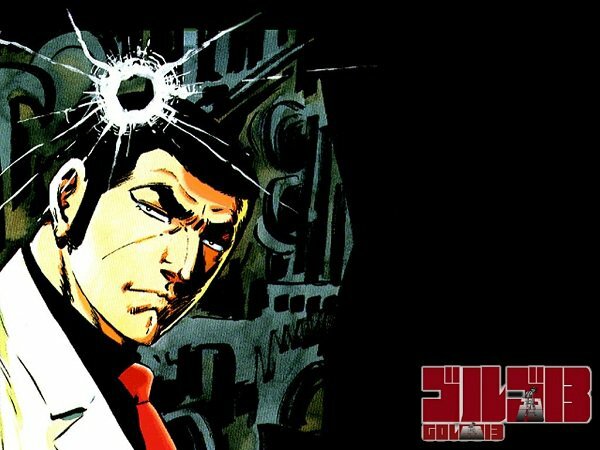 The name Seiko surely rings a bell with most people but what exactly is a Golgo 13 and what does it have to do with a watch?! Golgo 13 is the name of Japanese cultural icon and central character in a renowned manga series by Takao Saito and Seiko has created four limited edition timepieces inspired by and in honor of the professional assassin featured in the comic series. Golgo 13 is the longest running manga series in publication to this day and boasts legions of fans worldwide therefore it’s no surprise that Seiko would want to dedicate four limited issue watches fit for an assassin. 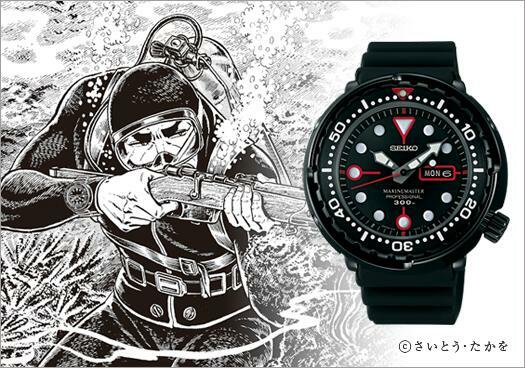 Seiko is offering Golgo 13 fans three watches named Land, Air and Sea which will only have 500 pieces for sale as well as 400 pieces of the fourth watch model which some are saying is simply referred to as the Seiko Limited Edition Golgo 13 EPD. Unfortunately, these timepieces will only be available in Japan. Seiko refers to the Land watch as a simple mechanical watch equipped with a compass. The design is sleek, simple and perfect for those braving the elements of the outdoors. The watch is encased in materials which protect the inner workings of the watch from shock as well as the outer body from the ravages of the land and sea with water proofing to 20 ATM. One of the unique features of the Land watch is the dial which is decorated with a rifle motif which makes for increased visibility. The Air model which on Seiko’s Japanese site is also referred to as Sky, is termed as an authentic pilot watch with a circular slide rule for measuring aviation. The timepiece is water proof to 10 ATM and with a polyurethane band. Equipped with a solar chronograph quartz movement, stop-watch, alarm and revolving bezel with slide rule making this watch ideal for in-flight calculations and unit conversions. Seiko’s Sea model features a high-torque quartz movement and is water proof to 300 meters making this timepiece the perfect diving watch. Similar in appearance to the Land model, Sea is made to be water and air tight to the world’s highest levels ensuring visibility and precision even if the depths of the sea. The last of the four new models which appears to simply be called the Seiko Limited Edition Golgo 13 EPD is most likely the most interesting and attractive. 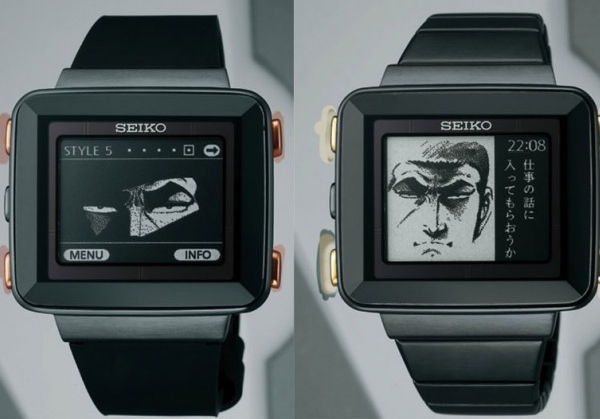 The watch features an e-ink display which displays the images of Golgo 13 on the screen which makes for a striking and attention-grabbing watch. With a solar powered quartz movement and exciting details, this timepiece is the ultimate accessory for the Golgo 13 manga fan.Seiko Four Limited Edition Golgo 13 Watches. It’s Valentine’s Day again, gentlemen. That’s right. You’ve probably already bought your wife/ girlfriend/ mother/ grandmother/ secretary/ secret crush the perfect gift and made reservations at the perfect restaurant where you’ll watch her eyes light up as she opens that beautifully wrapped symbol of your love and devotion. But, if that’s not the case and you find that you’re at a loss this year, fear not – Seiko has you covered. Yep, the Japanese watch guys. Really. Not only will this sweet gift impress the lady in your life with your sense of style, it will also show her how much you care about her heart. Literally. Seiko Corporation of America, a subsidiary of one of the world’s best-known manufacturers of timepieces has launched a ‘Giving Hearts’ campaign this year in support of the American Heart Association’s Go Red For Women® crusade. To support and help publicize this noble endeavor, Seiko USA has designed a special watch this year and is contributing $15 of every one sold through March 1, 2012 (with a minimum $100,000 contribution.). The company has also launched a ‘Giving Hearts’ web page on their site where consumers are invited to design their own virtual hearts and dedicate them to loved ones via email or for display in the public forum. (You can pick from a variety of patterns, borders, decorations and dedications.) Visitors may vote on their favorite designs and enter to win a free watch. Called the Go Red For Women Seiko Tressia, it’s a slender women’s dress watch with a black ion bangle-style bracelet with a jeweler’s clasp, Swarovski crystal accents and an AHA heart logo on the face. It’s selling for $177 online and is even water resistant up to 30 meters. “Tressia’s heart is in the right place,” says Seiko. Now you can be sure your special valentine knows that yours is too. Save a woman’s life. Give her pretty jewelry. Seiko Watches introduced a limited edition Sportura Chronograph to celebrate their three-year partnership with internationally successful Futbol Club Barcelona who visited Seiko in Tokyo following their FIFA Club Cup win. During their stay in Japan, FC Barcelona visited the new Seiko Salon at the Wako store in the Ginza district of Tokyo. FC Barcelona President Sandro Rosell presented Hattori with a Barcelona jersey with his name on it as a symbol of the strength of the two companies’ partnership. In the creative spirit of Seiko Watches, 11 FC Barcelona players helped design a unique wall clock. Each player signed his name next to his respective number on the clock to create a one-of-a-kind timepiece using the best elements of Seiko design and technology. The clock can be seen on display at the Seiko Museum Ginza Exhibition in Tokyo. 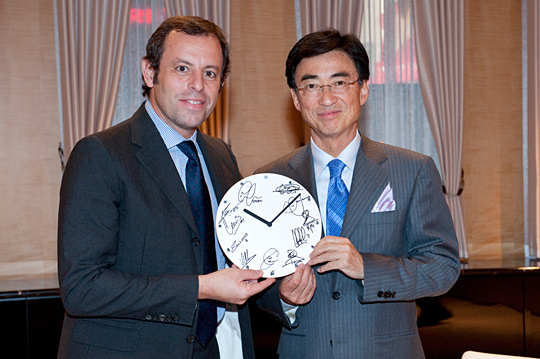 Seiko CEO Shinji Hattori and FCB President Sandro Rosell show unique clock at Seiko Salon in Tokyo. 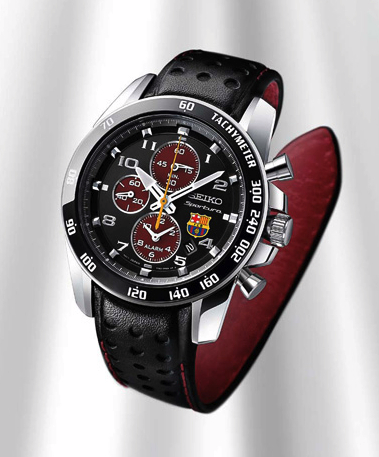 SEIKO Sportura FC Barcelona Chronograph displays colors and crest of champion football club. The unique timepieces come with a commemorative leaflet with the pictures and signatures of FC Barcelona players. Seiko is giving fans a chance to win one of the special Sportura FCB Chronographs in the SEIKO x FC Barcelona Fastest Goal Campaign. Through Seiko’s official Facebook page, fans can predict which FCB player will score the fastest goal in a series of upcoming matches. After the last match in the set, a winner is chosen from those who guessed correctly. The lucky fan from Session 3 (Jan. 6 to Jan. 27) will soon be announced on Seiko’s Facebook page and will receive one of the watches Seiko says “express the dedication to perfection that SEIKO shares with the most successful team in the world.” Seiko’s official website offers a fun and free SEIKO Sportura FCB Watch Widget for download and embedment that delivers the latest Seiko news and Twitter feed updates, available in English, Spanish, or Catalan. Following their Club World Cup win, Seiko continues to support Barcelona-Japan partnership as the INAC Kobe Leonessa makes a training visit to FC Barcelona. The formidable Japanese team, including seven players from the 2011 FIFA Women’s World Cup champion team, will play a friendly match against Superlinga leaders FC Barcelona Femenino on Thursday Feb. 2. Sponsored by Seiko, the match is dedicated to the victims of last March’s tsunami and signed jerseys from the match will be auctioned in Toyko to support continuing relief efforts.